by Jack D. Terry, Jr. In 1915 on the plains of Texas, Southwestern Seminary established the Department of Religious Pedagogy, which became the first school of religious education anywhere in the world of academia. Founded specifically “to touch the lives not only of the special educational students who will come to study Sunday School work but also the lives of all the students who come to study here,” the school, over the next 100 years, developed into a crucial piece not only of Southwestern Seminary, but of the eternal Kingdom work that would be accomplished by its students. This volume recounts the first 100 years of this school’s history, covering how the budding department ultimately developed into the Terry School of Church and Family Ministries, as it is known today. 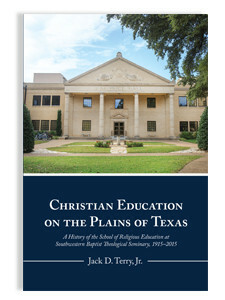 Written by Jack Terry, a former dean of the school and its namesake, this volume will prove a valuable resource for anyone who is connected to Southwestern or who possesses even a passing interest in history, especially as it relates to equipping the saints for the work of the ministry. Jack D. Terry, Jr., has been part of Southwestern Seminary for nearly 50 years. First as a student, then as a professor, then as dean of the school of religious education, and finally as vice president for Institutional Advancement, Terry has devoted his life to the ministry of Southwestern. He is married to Barbara, and they have two children.